Hands-on scientific research with giant leatherback sea turtles in Costa Rica for grades 5 and up. Students spend 3 nights working with giant leatherback turtles at Estacion Las Tortugas along the Caribbean coast. Patrol nesting beaches at night and relax and explore the rainforest during the day. In addition, the group can visit a remote indigenous community and learn about their culture and traditions and learn about rainforest creatures at a butterfly farm. Price: From $1,300 per student, depending on total group size. Teachers travel free with 8 paying students. Recommended for students Grade 5 and up. Other available activities include school visits, volunteering at a wildlife rescue center, farm homestays, Arenal volcano, whitewater rafting, ziplines, and more. Let us know if you have a specific activity you would like to include. Thank you! We will be in touch shortly. Feel free to call us at 800.215.0378 if you need a quick response. Our guides pick your group up from the airport and take you to Francisco's Lodge, a comfortable hotel in a country setting, to get a restful night’s sleep. After breakfast, board your group’s private bus where you will head to the Central Caribbean coast. Along the way, you will stop for lunch at a wonderful butterfly farm. At Las Tortugas, you will spend three nights at one of the country’s most important leatherback sea turtle nesting beaches. 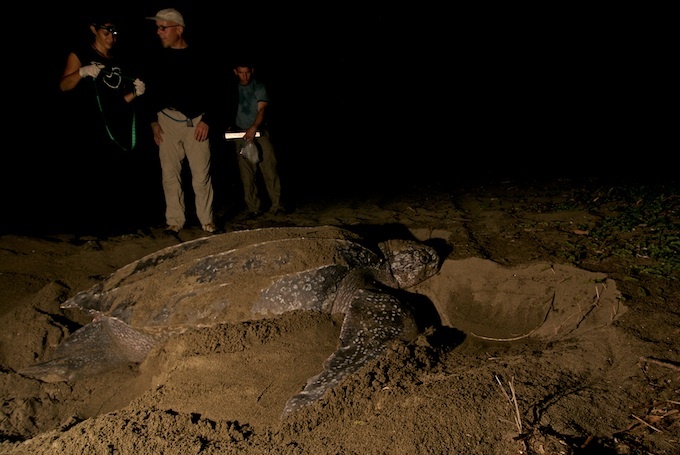 Your group will help monitor the beach, looking for nesting turtles, helping to collect data on giant leatherback or green turtles, and transplanting the eggs to a protected hatchery. Daytime activities include a boat ride on the rainforest canals to look for wildlife including sloths, monkeys, & caiman. You can also visit the project's Turtle Museum or relax in a hammock and listen to the sounds of the beach and jungle. There will also be volunteer activities, including helping to clean the beach, building the hatchery (early in the season), or releasing hatchlings (late May - June). * Please note that Las Tortugas is a fairly remote and isolated research station. The rooms are very basic and students are expected to participate in cleaning up dishes after meals. The station has limited electricity and no hot water. Bathrooms are shared between two rooms. Meals are simple and often include rice and beans. Leaving Las Tortugas, your group will head south to the small coastal town of Cahuita, gateway to the national park which has some of the nicest beaches in the country. Picnic on the beach and enjoy the white sand and clear water. Evening is open to rest or plan group activities. Heading inland towards the Talamanca Mountains, your group will visit an indigenous reserve to learn about traditional indigenous life and how they survive through organic farming of chocolate and bananas. There are two options, one taking a 1.5 hour boat ride to a reserve, another offering a 1.5 hour hike to a small village. The highlight is learning the entire process of making chocolate, from tree to delicousness! After breakfast, your group will head back to the Central Valley, your group will celebrate your last night in Costa Rica and reflect on what you have learned.